Description BRICKFORM Dye-N-Seal is a translucent dye, designed to penetrate and color any cementitious surface. Dye-N-Seal dries quickly, reducing installation time and construction costs. In most cases, cleanup and sealing can be done in the same day. It is ideal for polished concrete and it can be used as a base-color for BRICKFORM Blush-Tone Acid Stain to achieve dramatic results. BRICKFORM Dye-N-Seal penetrates the surface of newly cured or existing concrete, creating a layer of translucent color that dries quickly and will not chip, crack, or peel. The colors produced in each section of concrete will be unique with captivating, multi-colored intensities that become a permanent part of the concrete. Colors can be combined to create an unlimited number of color variations. When applied properly, Dye-N-Seal creates intense color that has a look similar to the mottling effect of acid stain. 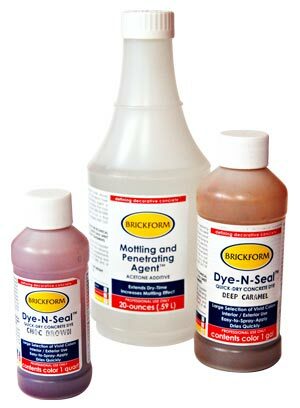 BRICKFORM Dye-N-Seal is packaged in powdered form to be mixed in proportion to acetone. BRICKFORM Dye-N-Seal is durable enough for commercial applications like restaurants, showrooms and retail spaces. It can be used to create vivid, new color for interior floors or concrete countertops. BRICKFORM Dye-N-Seal can also be used to correct areas where acid stains have little or no reaction on the concrete surface. Dye-N-Seal is excellent in vertical applications, stencils, and logos because it dries so quickly. In addition; after 28 days, the concrete should be sealed with a BRICKFORM Sealer for protection.